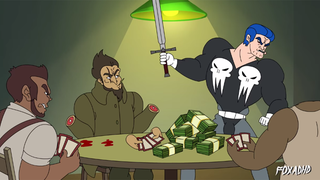 Frank Castle might not have super powers, but the folks over at ADHD gave him a very suitable one: The ability of dropping silly puns... non-stop. The puns in Age of Ultron have nothing on this. These are so bad they’ve gone past good and back to bad again. But they all fit The Punisher.